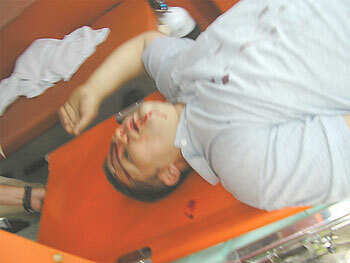 Today Friday May 19, 2006, the army escalated its violent tactics against non-violent protestors in Bil’in, leaving 26 people injured, including Hitham al-Khateeb, who was filming the demonstration, suffered a fracture in his skull from a tear gas canister to the head and is in the intensive care unit of Ramallah Governmental Hospital. Israeli soldiers often aim teargas canisters directly at demonstrators, a practice against the Israeli militaries regulations. The soldiers also regularly target people filming the demonstration. Seven Palestinians were arrested; two Israelis and two internationals, all have been released. 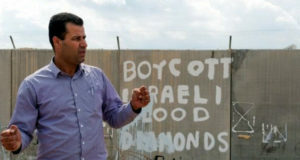 The people of Bil’in, with international and Israeli peace activists, marched to the Apartheid Wall to protest the confiscation of their land by the Wall. Non-violent demonstrators carried a banner and held signs illustrating the connection between the villages that were destroyed in 1948 Nakba, and the villages that are being torn apart by the building of the Wall today. 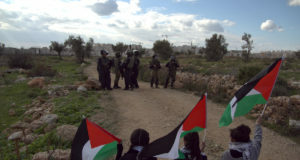 Using a large carpet thrown over the fence, thirty protestors crossed the barbed wire that separates Bil’in villagers from their land and entered onto the patrol road. They attempted to exercise their right to enter their own land and sit on the road, but the Army and the Border Police immediately responded with sound grenades, tear gas, rubber bullets and beating. The protestors were forced to spread out, but continued to stand their ground for one hour despite many arrests and serious injuries. They continued to fire tear gas and sound bombs at the crowd as they evacuated the patrol road and as they were leaving the area. And at 6pm the army continued to fire at people in the area, wounding Amer Hisham, 21, and Abnafez Abdel Karim, 15, with a rubber-coated steel bullet in the legs and back, who were also taken to the hospital in Ramallah. The names of the 7 Palestinians that were taken to the hospital are: Hitham Al-Khateeb, Akram Khateeb, Ahmad Mohammad Hassan, Ratib Abu Rahme, Samer Burnat, Mohammad Monsour, Adeeb Abu Rahme. Others that were injured are: Mazen Ahmed Yasin, Mujahed Abdul Rahman Said, Jowad Amran Khateeb, Fuad Mohammad Samara, Jabber Muhammad Abu Rahme, and Nimer Abu Rahme. Four children were injured, all 14 years old: Karasam Barakat Khateeb, Ali Omar Khateeb, Mohammad Fathi Abu Rahme, Salem Abdul Kareem Mansour. The journalists that were injured are Eyad Hammad from AP, Musheer Karakrah from Ma’an News Network, and Abbas Almomani from AFP. The two internationals injured were Victor from Sweden and Allan from Scotland. 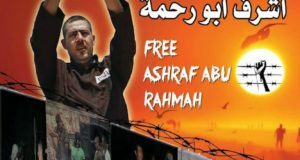 The Palestinians that were arrested were all released, and names are: Muhammad Khateeb, Abdul Fattah Burnat, Mujahed A’ashal, Muhammad Khaleel Abu Rahme, Basem Ahmad Aisa, Ahmad Zohad A’ashal, Naseer Samara. 5 Israelis and 2 internationals.